Ardmore Ardmore (Irish: Aird Mhór, meaning "Great Height") is a fishing village in County Waterford, Ireland, not far from Youghal on the south coast of Ireland, with a population of around 330, although this varies with the tourist season. It is believed to be the oldest Christian settlement in Ireland. Saint Declan lived in the region at some time in the period 350–450 AD and Christianised the area before the coming of Saint Patrick. Ecclesiastical Ruins - On a hill above the village is a well-preserved 30m high, 12th-century round tower and the ruins of a Cathedral and oratory dating from the 13th and 8th centuries respectively. One of the outer walls of the Cathedral features some stone carvings retrieved from an earlier 9th-century building. The carvings include a very early image of a harp, and images of Adam and Eve in the garden also a representation of "Solomon's judgement". The Cathedral also contains two Ogham stones, which rest in small alcoves. Some elements of the original structure can still be seen within the building The present Church of Ireland church (St. Paul's) is close to this complex. The village is steeped in history from the earliest days of Irish Christianity over 1,500 years ago. The 12th Century Round Tower is perfectly preserved and is one of the finest of its kind in the country. 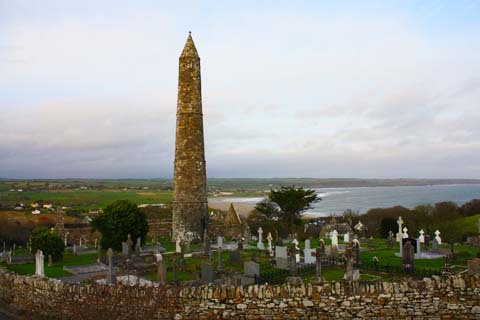 Ardmore was the home of St. Declan, who is believed to have brought Christianity to this country even before St. Patrick arrived in 432. The ruins of the Cathedral with its famous gable showing boldly carved biblical scenes, the burial place of St. Declan and the nearby Holy Well and Oratory of the Saint show a wealth of history. Ardmore is one of the jewels of the tourism crown of County Waterford. Perched on the cliff top overlooking one of the finest beaches on the south coast, Ardmore is a haven of tranquillity and commands breathtaking views of the Atlantic. Located just five miles off the N25, Ardmore is easily accessible from Dungarvan and Cork. Its impeccable presentation and quaint streetscape makes Ardmore a place of choice to live and visit. The village offers excellent accommodation and top quality local cafes, restaurants and bars in beautiful surroundings.